Brainstorming should be a valuable part of each business. However, doing it right is a fine art, as a brainstorming session can easily transform into an unproductive free for all that people don’t take seriously. In this blog, we’ll take you through the best techniques on how to brainstorm in meetings. When you organise a brainstorming session, you want to have a loose and flexible framework in place, but not too loose. Ideally, you want to find that balance between a rigid, day-to-day structure and an unorganised coffee chat. Therefore, it’s always good to implement some ground rules. Shouting, for example, is a big no. Having a brainstorming session that is too vague can actually prohibit creativity. Ideally, you want the subject to be relatively focused, so that people can come up with similar ideas and work towards a shared goal. For example, ‘growing the business’ is a bit of an ambiguous and broad subject. ‘What can we do to be more environmentally conscious,’ however, is a much more restricted topic, which will help lead the discussion. You’d be surprised how little time you need to come up with a fantastic idea. Oftentimes, limiting yourself to short 50-minute sessions (with a quick 5-minute break halfway) is the perfect way to get a lot of ideas down in a condensed period of time. It shouldn’t feel like a long and arduous meeting. Instead, it should be interactive, fun, and intuitive. Post-it notes are a great way to collect ideas and organise them visually on a wall. This is a great way of combining several ideas and getting people involved in creating some mind maps. The best thing? You can do it in just about any meeting room and you don’t need a projector or whiteboard. Plus, there’s something stimulating and tactile about writing your ideas on post-it notes and moving them around the place. While you shouldn’t be quick to judge or reject ideas, there will be some scenarios where you will have to move on and filter out some contributions. Always do this in a courteous and polite way, taking the time to explain why you don’t think the idea will work out for the current brainstorming session. Make sure to let your participants know what the focus of the session is. A brainstorming session is not a free for all – it should be a guided process that helps everyone contribute, rather than becoming a forum for silly ideas. Make sure to collect ideas at the end of your meeting so that you know exactly what you’ve discussed. This can be in the form of post-it notes, or pictures and screenshots of the mind maps you’ve made. You can always delegate this role to someone else to ensure that you can still guide the brainstorming meeting well and that you aren’t too stretched. A brainstorming meeting is arguably only as good as the change you make after it. Don’t just let your good ideas go to waste. You will need to set up teams to monitor the progress and work towards achieving your goals. A brainstorming meeting is only the beginning, but with the right team and mentality, it can have hugely positive impact on your business. 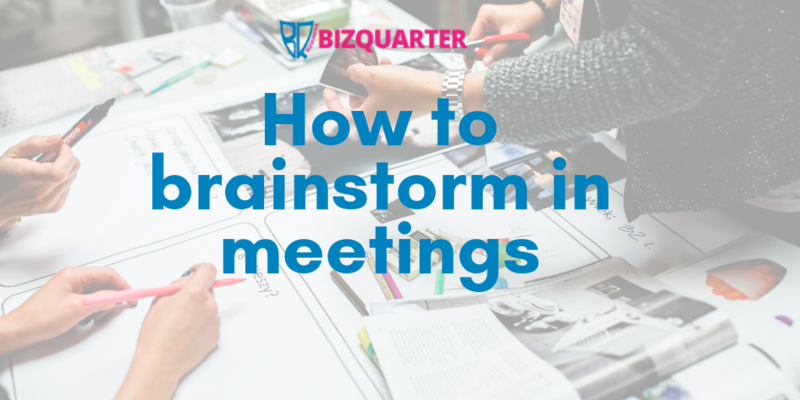 At Bizquarter, we have everything you need to have a brainstorming session or planning meeting. Use our easy and flexible booking system to book your next meeting. Bizquarter Meeting Rooms – Don’t just make a good impression. Make a lasting one.